You won’t read this much today but Paolo Di Canio was right. Not about the man management, the seriously questionable politics, the rigid and bloody-minded insistence that his “system” was the only way to play or the ludicrously high opinion that he had of himself. But when he talked of Sunderland football club requiring a “revolution”, it was the most accurate thing a Black Cats manager had said for many a year. In the rush to condemn the extremes of Di Canio’s failed philosophy, let us not forget that the club he inherited was at a painfully low ebb. Enthusiasm had drained from the terraces and from the dug-out there was only flannel and denial. The mediocrity stretched back for years, with Sunderland fans desperately frustrated that manager after manager had fed them on a diet of subterranean expectations and mild rebukes if they dared expect better than the negative, regressive tactics that became a theme of the fag end of Martin O’Neill’s doomed regime. Di Canio’s message was different. He spoke of challenging the idea that merely surviving in the Premier League was success for the Black Cats and prompted, provoked and cajoled his squad to expect better from themselves. When Wearside partied in the wake of the 3-0 derby defeat of Newcastle, he counselled that players and supporters should not celebrate because the club wanted to achieve more than that. It is for this, more than anything, that many supporters were happy to stand alongside Di Canio as he began to lay the foundations for his ill-fated revolution. And while we assess the fall-out of a spectacularly ill-judged reign, lets not chide Black Cats fans or anyone else who welcomed a man prepared to imagine something better for a club with fearsome potential. 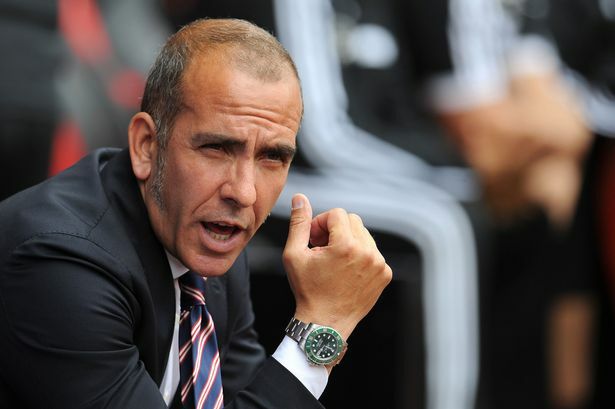 Di Canio’s problem – and it was a big one – was that he failed to realise that the best leaders have the capacity to inspire. He name-checked Sir Alex Ferguson a fortnight ago but in his desperation to embrace the fear factor he neglected to pay attention to two key tenets of Sir Alex’s management style: that he was prepared to compromise and that he fiercely defended his players in public. Only when they had out-lasted their purpose, like Roy Keane as his powers waned but his poisonous words did not cease, did he fall out with them. And anyway, Di Canio was not – and has never been – Sir Alex. He was not Jose Mourinho either, which was another name he dropped on Thursday. That was always the curious point about Di Canio: that his achievements in football never quite matched the monstrous ego. A good player but not a great one, his career saw him play for Juventus, Lazio and AC Milan before a tour through England that saw him play for West Ham, Celtic and Sheffield Wednesday (among others). Don’t get me wrong, it is a fine CV but not one that is going to earn him instant the respect of footballers who have earned more international caps than him. This was the problem with his “revolution”, he never won the hearts and minds of those who might deliver it. The fall-out with Phil Bardsley was understandable (although his subsequent comments played a big part in Sunderland not being able to shift him in the summer), but subsequent problems with Cabral and Lee Cattermole seemed to be over much less serious indiscretions. Continual public calling out of the players without really ever accepting his own role in the problems was always a recipe for disaster. Speaking from experience, his hair dryer treatment was not especially fearsome. He bawled me out over a (very well-sourced) Tweet I sent in Denmark regarding him telling the players to leave without eating after the win against FC Midtjylland. He said that wasn’t true and proceeded to lecture me on the point in front of colleagues for ten minutes, ludicrously comparing his treatment to Lord McAlpine. My information was, in my opinion, rock solid but there was no chance to react as he dramatically laid into me in a bizarre rant. I sat there pretty untroubled thinking ‘You won’t be here for long enough for this to affect our relationship’. If I was thinking that, how would a player on a big contract react to a similar rant? We got the answer over the weekend as they rebelled against his regime. There were things to admire about Di Canio, not least his obvious intelligence and vision. Thought had clearly gone into his vision for Sunderland and for a time it felt like it might come off, not least when the team roared out of the blocks against Tottenham in the Barclays Asia Trophy. It lost momentum in the later months of the summer and friction seemed to come when Di Canio’s call for an English playmaker went unheeded. When the team lost to Fulham Di Canio couldn’t bring it back and the players sensed which way the wind was blowing. His departure will be unlamented within the club, where he made few friends. But give him credit: for delivering vision and ambition to the club again he gave them a shot in the arm they needed. If someone can come in and rebuild that while toning down the narcissism, they might be onto something.